We depart Whitianga Wharf at 10:00 and head out into Mercury Bay. Once our plan has been made, we’ll raise the sails and head off to some of the most spectacular coastal scenery that New Zealand has to offer. 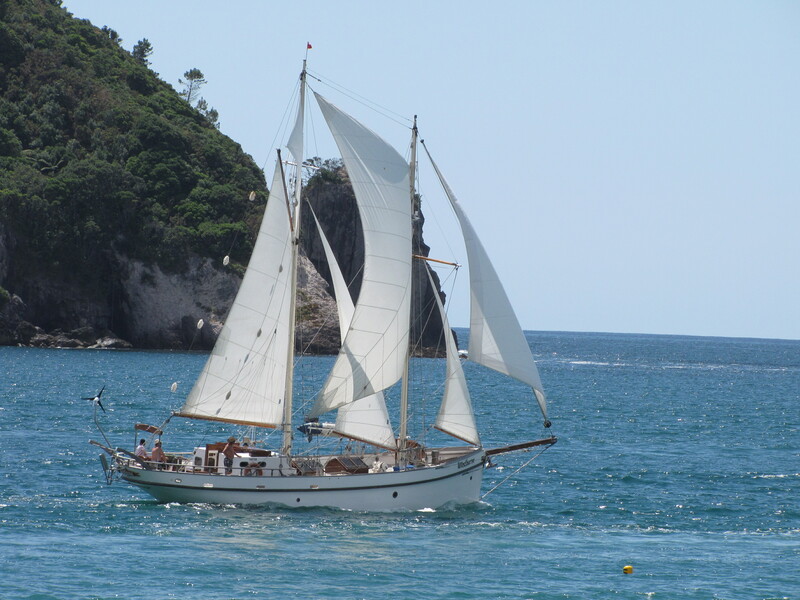 You are welcome to help sail the old schooner to some of these breathtaking places-Cathedral Cove, Devil’s Point, Pink Beach and the Hole in the Wall, just to name a few. Around Midday we head into a bay and drop anchor, so we can have lunch a swim and snorkel. When we set sail again we’ll keep a sharp lookout for dolphins, whales and a huge variety of other sea life. Please be at the Whitianga wharf by 9.45 am so we can stow your gear and show you about. Dress Code, warm clothing, a hat, sunglasses, sun block, camera and swimming togs and towel. If you have a medical condition, are prone to seasickness, please ensure that you have your medication with you. Includes free tea and coffee on request.